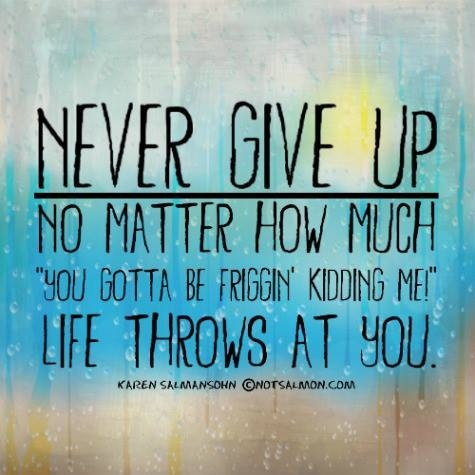 See that Never Give Up sign? That’s my life right now. I realized that I just disappeared and my last post was almost 2 weeks ago. Not my usual posting schedule for you new readers so let me just back up a bit. Welcome to my new home. I’ve set up residence in Crazy Town. Can you see my new house? I’m living on the corner of “I’m working on that” and “Are you freaking kidding me?” Yeah, see there I am … can you see me waving like a crazy person. Because that’s what you do when you live in Crazy Town. You walk around the house, talking to yourself and wave your arms around like a crazy person. I’m launching my Strategy Builder workbook on November 1st. Yep, that’s less than two weeks away. After all that writer’s block stuff over the summer, I finally got the thing written and I’m waiting on the final edits. Launching a new product requires more than just writing the thing. I have to work with programmers and designers to get my site ready. I need to write emails, newsletters, blog posts, scheduling tweets and facebook posts … man, I’m worn out just typing out that list. And I’m sure I’m forgetting something so I’ll have to check the many to-do lists that are posted up all over my workspace. And then for some weird reason, I agreed to teach 6 (yes, that’s SIX) workshops during the same month I’m launching my workbook. OF course there’s clients – my usual suspects, one new client and an old one that crawls out of the dark every now and then and wants me to work on two separate projects. And from the workshops, I’ve got two new coaching clients so somehow, I’ve squeezed them into my schedule. Oh yeah, let’s not forget what’s left of my personal life which includes Jake’s baseball games, that cooking/cleaning thing I pretend to do and the weekly surprises like when my car battery died or the day I broke yet another phone. So there you go … I just wanted to stop by and tell everyone that I miss being in the Blogging World with you guys. I think the only person who has seen me lately is Kate from Did that just happen when we cross each others path on Pinterest. Trust me, I have some stories to share and some notes I’ve scribbled in my blogging notebook that should show up as a few posts next month. And the good news is that my special order of Perfect Calm showed up last week so at least I’m just a crazy person and not one who is ranting and raving with everything that “you gotta be friggin’ kidding me” life has thrown at me in the past month. Alright .. back down the rabbit hole I go. See you all when I come out on the other side!!! I do like us passing like ships in the night on Pinterest! You’re a great pinning buddy! Yes, it was a happy day when I got the call that my order was in. I agreed to teach the workshops when I thought I was going to launch the workbook in sept. Lesson learned, things will usually take longer than you think it will take. Glad business is booming and your services are in high demand. What’s up with you and phones? Its good to be busy. And the phone stuff, I’m a big clutz. I’m consitently clumsy, I trip, drop stuff all the time. This last phone even had a protective cover on it and I broke the glass. Its just the nature of being me. It’s good that you accept that part of you. First off I gotta get me some of that perfect calm! LOL You know that saying if everyone tossed there problems out onto the street you would want yours back! Well there you go! Your blog is not showing up in my reader so I am just writing this after you visited my blog yesterday so that’s how bad I am at just visiting on my own and not relying on my stupid broken NEVER WORKING always changing the format reader! Hope Jake’s team did well! LOL I gotta get some of this stuff! Check out your locsl health food store. I’ve created my own organic cocktail that seems to helping me with all these changes going on with my body.